Coloring pages are a great way to let your kids get creative, and give them something to do on those frightful winter days. Getting your kids outside to play is going to start happening less and less as the weather drops, so prepare yourself with these Christmas themed coloring pages! Kids will love these fun and free coloring pages! You might surprise them with a new pack of crayons or colored pencils! It seems everyone loves a fresh pack of art supplies. No matter your age, this never gets old. So grab some crayon and several of these free coloring sheets and keep the kids busy all season long. Mom or Dad might even want to get involved and color with the kids. Not only is this fun but a frugal way to spend time together. Some of the best memories are made from simple activities like this. Make some Christmas Cookies like Easy Grinch Cookies or Adorable Reindeer Cookies, play some Christmas music and make an afternoon if it! We recently did this and the entire family had so much fun coloring and making cookies all while listening to wonderful tunes of the holidays. Truly you do not need to plan elaborate outings or fancy activities. Kids just enjoy being together and doing fun and simple ideas. Let’s all try to be intentional this holiday season in spending quality time with our family and make memories sure to be cherishes for years to come. We love to make a coloring station with Christmas coloring pages. It makes it so easy to have everything organized and ready to go when the kids want to color. This is perfect for holiday parties for a quick but fun (and frugal) activity. It is also a great activity for the kids to do if you need a few extra minutes to prepare dinner. The kids will stay busy and have fun while giving you a few more minutes to get things ready around the house. 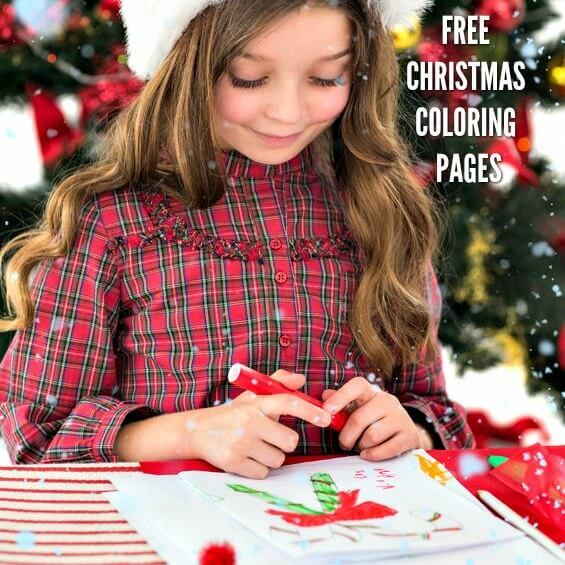 The kids will love these Christmas pictures to color! I’m going to print out several to keep on hand for when I need a quick activity. These are perfect for Christmas break, or while the Christmas cookies are baking! So festive! The entire family will love these Christmas coloring pages this holiday season. Just click on the coloring page and print what you like. These coloring pages are so cute and sure to be a hit. 15 Christmas Coloring Sheets kids will love! Which Merry Christmas coloring pages do you plan to use? You might want to print several and keep them on hand for kids to use them! I never know when I might need a quick activity. It’s a great plan to print several of these out and you will never be without a fun and festive activity for Christmas. We love the Christmas tree coloring page ideas. The free Santa coloring pages are also a big hit too around here. Whether you are looking for Christmas coloring pages for preschoolers or older children, there are Christmas coloring pages pdf options for everyone! There are lots of Christmas coloring pages online to choose from. Kids of all ages will have a blast and love doing these fun and free coloring pages. The holidays tend to bring out the child in us and even your older kids might want to join in the fun. If you have leftover crayons, learn how to make crayons shaped like mermaid tails. These are so fun and a really neat way to use leftover crayons. We have even made these as party favors before. Kids love them and it makes me happy knowing we do not have a lot of waste. Awesome ideas ! Thank you for the free coloring pics and the ideas of crafts to make ❤️Loving it !